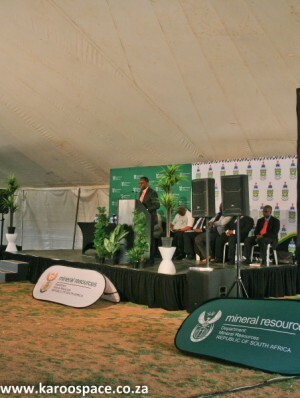 The recent Shale Gas Imbizo in Cradock on 21 January 2016 featuring new Mineral Resources Minister Mosebenzi Zwane was a long time coming. And the response from locals must surely have come as a surprise to Government. Years ago the Department of Mineral Resources had talked about going out to speak to the people about shale gas. Real consultation with Karoo communities. At some stage in 2014, it emerged they had done no such thing. Three times Departmental roadshows were announced, then cancelled at the last minute. Then in November 2015, it was announced that the new Minister of Mineral Resources, Mr Mosebenzi Zwane, would hold a Shale Gas Imbizo in Cradock. 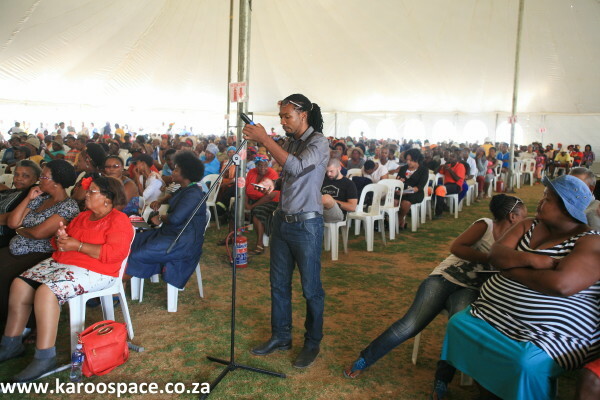 Twice the Imbizo was announced (first for 2 December, then 17 December), and cancelled. There was only a few days warning that the one set for 21 January 2016 was actually going to take place at the Lingelihle Stadium. 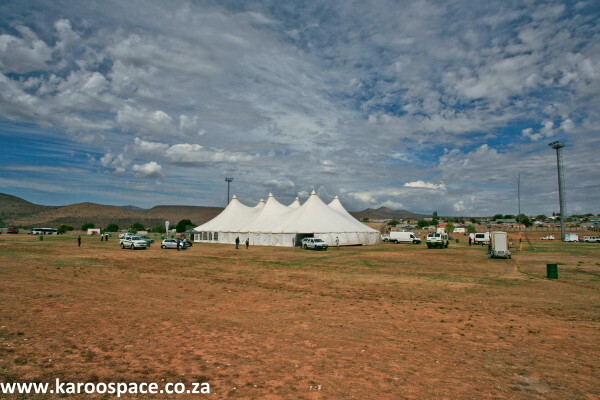 A massive white tent, big enough to hold a circus, was erected. Thousands of plastic chairs were hired. By 10am, the advertised starting time, every armoured police car in the district seemed to have gathered in the vicinity of the stadium. Buses with hundreds of people from nearby Tarkastad, Hofmeyr and Middelburg arrived, along with a steady stream of locals, mostly from Lingelihle and Michausdal townships. Two community liaison people from Shell arrived. There were few white faces. For the rest, it was local community, including church leaders who were ushered to the front. There were dignitaries from the local Inxuba Yethemba Municipality, the Chris Hani District Municipality as well as Minister Zwane and his entourage, including his director-general Dr Thibedi Ramontja. Banners from the various municipalities flapped in the breeze. 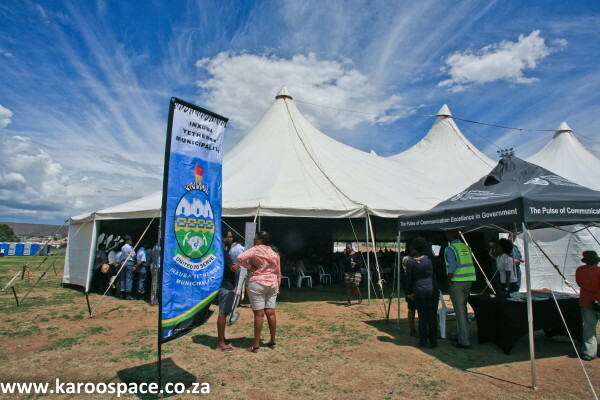 Under a gazebo branded “The Pulse of Communication Excellence in Government”, there was a choice of three Government publications to take away – focusing on saving water, the highlights of the State of the Nation Address and the Department of Cooperative Governance’s Community Work Programme. There was nothing on shale gas or fracking, or even a brochure from the Department of Mineral Resources, for that matter. 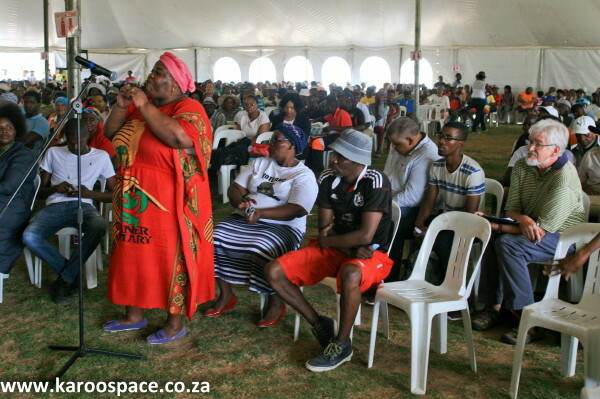 Executive mayor of Inxuba Yethemba Municipality Nyameka Goniwe, widow of Cradock Four struggle stalwart Matthew Goniwe, welcomed various dignitaries and the crowd of at least 1 500 people. Everyone had been given a bottle of water. Women with black bags patrolled the precinct, pouncing on any bits of litter. But for all the hoopla around the event, and the very long build-up, the Minister’s speech was oddly anticlimactic. He delivered his speech in English and received polite applause at the end of it. The angle most news aggregators later picked up on was that South Africa might have the fifth largest shale reserves in the world. This is not only outdated, but almost certainly completely wrong. However Zwane did say they are taking the conservative view that there may be 30 trillion cubic feet (tcf) rather than the 485 tcf that would put the Karoo Basin among the top five shale gas plays in the world. Zwane emphasised that Government was responsive to the people, as the moratorium and regulations showed. Then came a five minute video on hydraulic fracturing for shale gas that officials said would explain everything. Except it didn’t. It was edited stock footage from Chesapeake Energy (not one of the companies with concessions in South Africa), mostly showing computer-generated imagery of a drill bit going through layers and layers of underground rock. Then it was question time, and more than a dozen locals put up their hands. They did not give the Minister an easy time of it. One person after the next harangued the Ministry in eloquent isiXhosa. They spoke about local people going off to get mining jobs and coming back sick. Would that happen here too? Many said they were fearful of water contamination and the effect shale gas might have on farming, livestock and the local economy. They said they would not tolerate other people being brought in to do shale gas jobs. Locals wanted to be given the skills. One said he thought this would be the first and last time they saw the Minister. They questioned the safety of fracking, the effect on health, the timelines, the possible nepotism. They wanted to know how shale gas and hydraulic fracturing might affect climate change. Some gave the local and district municipality officials a hard time too, accusing them of corruption and inefficiency. While the Minister sat watching, his Director-General Dr Thabedi Ramontja tried to address, downplay and negate some of the concerns about health and water contamination. He emphasised that exploration would determine whether fracking went ahead. 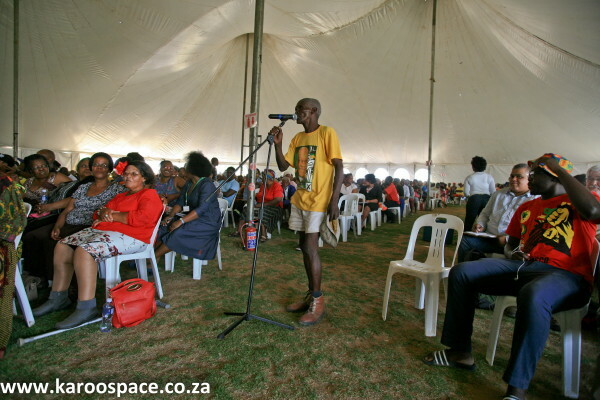 But it all had the feel of being an event to pacify, convince and satisfy the objectors and to seek blessing for a resolution which had long ago been taken in the absence of the Karoo communities. If the Ministry was expecting an unconditional go-ahead from the community of Cradock and its neighbouring towns, it did not receive one. One of the officials had paid tribute to the Cradock Four anti-Apartheid activists assassinated in 1985 – but it was the spirit of the people and their engaged civic-mindedness that spoke more eloquently of the Cradock Four legacy than any words could. Dr Stefan Cramer and his wife Erika Haupt-Cramer attended the meeting. Dr Cramer is a hydrogeologist from Germany, currently seconded to the Karoo by the Southern African Faith Communities‘ Environment Institute (SAFCEI) and is based in Graaff-Reinet, to assist local communities with the problems of fracking and uranium mining. They both found the Imbizo fascinating and thought-provoking. 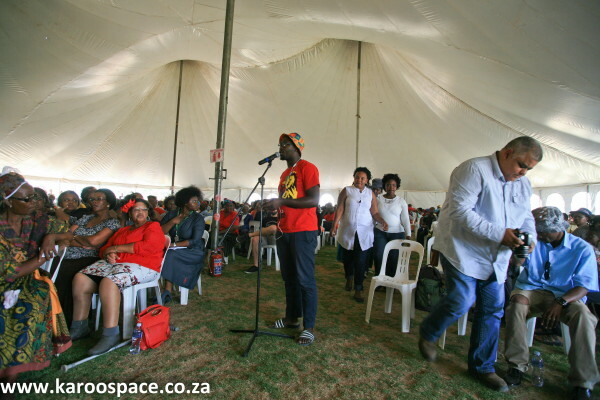 “Firstly, when I attend such a meeting I am not afraid for SA’s democracy. The critical and inquisitive spirit by the people is a good sign. No deference to the authorities, to the men in grey suits. It will be interesting to watch the next municipal elections. “Secondly the Department went through this thing as if to tick a box on someone’s list. The Minister’s speech was lifeless, perfunctory. It felt as if they were not really there, not really interested in the subject – and even less in what people might take home from such an event. “Thirdly, use of an inappropriate promotional video from Chesapeake as the only informative part of the meeting speaks volumes: is this the promotional engagement with the communities? Then good night. Erika and Stefan Cramer were also struck by the independently-minded people. “Most issues voiced by members of the community were not related to shale gas, but spoke of the anger of being left behind, of missing education opportunities, and neglect and corruption by the local government. Thank you Julienne and Chris. This is what we need to see. The people voicing their concern and standing up to the pathetic posturing of corrupt government along with the platitudes of OIL. This is a “war on humanity” and will as all others before it fail, dismally. The government through its No Show attitude giving credence to their ineffectiveness in governance. Look no further than the disgusting waste of taxpayers money on the most recent Davos summit. Jacob Zuma knew he couldn’t face the people he was supposed to enlighten as to who we truly are and how investing in South Africa would be to their advantage. No sir. What a brave step forward by those who obviously recognise the risks to the environment and their welfare. An alternative that they could explore, could be the introduction of solar technology on a large scale, which would provide skills training, ongoing jobs, both from an installation point of view, as well as from ongoing maintenance when required. The financing could also be an opportunity to give communities a stake in the operation, which would generate funds for community development. Thinking out of the box could create a whole new infrastructural model, which would be supported by the affected communities and save ecological destruction. So not a great deal about fraccing or gas exploration then? It is hard from a distance to gain an accurate picture of governance in South Africa, but I tend to despair. Your report above doesn’t alleviate that. A great shame – thank you for the continuing reportage. Wonderful wonderful people, our government underestimates their voters hugely!!! Thanks for another very informative and interesting report on the fracking saga. Please keep up with your reporting of local (and not so local) news. Wow, thanx Ms J, u have a way with words, I could picture everything from reading this report. These are the kinds of communities that are needed going forward. We need not be gullible citizens. Thank you for keeping us in the loop, on a very important matter. Wouldn’t it be wonderful to have a money-spinner with obvious benefits to many, and the country as a whole? Yet, stories abound of the negative impacts of fracking. My only hope is that all the requisite due diligence is done thoroughly, beforehand. Perhaps it has already been done and there are some who simply won’t heed the call to recognise the potential damage. I am all for exploiting the economic benefits, but not at any cost. I have in very recent years become a Karoo-lover, where the Karoo has become the destination for me, and not simply driving through to Cape Town. My recent road trips to the Karoo were marvellous, and I would like to carry on doing this in an unspoilt environment. Am I, and other Karoo-lovers, being selfish? We see the global impact of chasing short-term financial gain, at the expense of the environment. Let’s be very careful embarking on fracking, if we should be doing it at all. 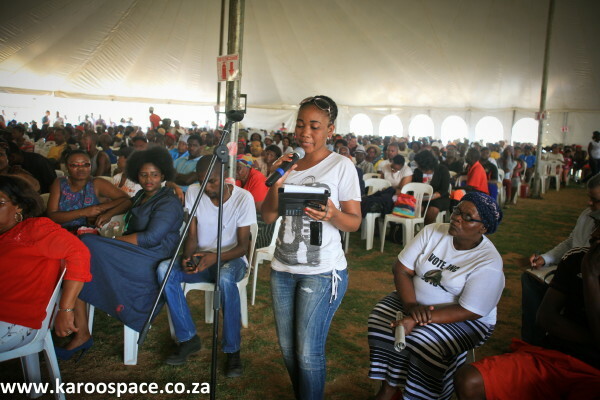 And let’s keep in mind the e-Toll debacle, of lack of engaging with the affected communities. More than that, the Karoo is a also a national treasure. May cool heads and good governance prevail!